Cramer FUGI Kit 5 helps to achieve clean profiles and permanent sealing. Fugi forming tools with 16 profile shapes. Produces step-by-step profiles without masking tape or cleaning afterwards. A releasing agent (soapy water) is not needed to apply the soft caulking mass (silicone). This process results in better adhesion and prevents mould from forming underneath. In the event that the profile application is not perfect, it is possible to remake isolated parts without having to remove the entire profile. With the FUGI Professional all standard sealants can be processed more easily. Cleverly attached guides help bridging intersections and prevent any subsidence when working these intersections. 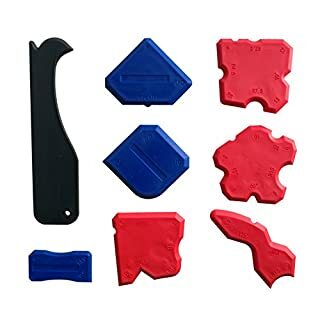 With this tool even complex and challenging joint work become a child's play. Here the unique technique of grouting without a separating agent also takes effect, thus notably minimising the danger of mould forming underneath the joints. Additionally the FUGI Professional allows for simply reworking blemishes without removing the existing joint. 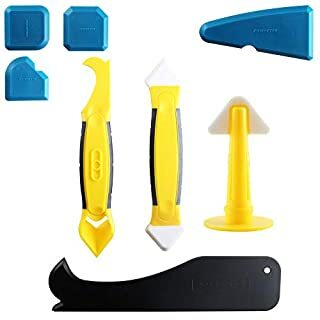 Cramer Fugi 7 Grouting & Silicone Profiling Kit with Grouting & Silicone Removal Tool. 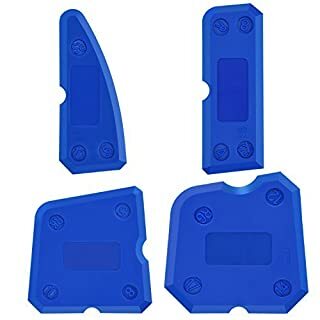 Kuuqa Pro caulk tool kit, creates a good looking seal every time, reduces wasted caulk or sealant; this set includes 1 rubber sheet and 8 tools with a variety of sealing edge sizes and shapes, easy to clean, reusable, can be used indoors or outdoor on caulking and sealing projects. 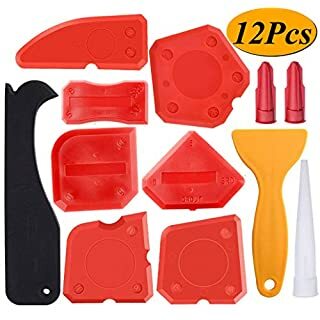 Features: -Good suitable for more different sealing jobs, to any edge, corner and joint -Made of durable materials, hard and not easy to be broken -Easy to use and quick use, you can sealing caulk by yourself, no need for masking tape -Come with plastic box, easy to storage Specification: -Material: Durable plastic -Product weight: 140g -Package size: 17cm x 9.7cm x 2.3cm/ 6.7" x 3.8" x 0.9"-Color: black/ blue/ yellow -Sealing edge size: SRD/ GROUT/ 2/ 4/ 5/ 6/ 8/ 10/ 14/ 20 - Quantity: 9 pieces Usage: Step 1: Surfaces must be clean, dry and free from oil and ust Step 2: Fill the sealant/ grout/ silicone, than remove any excess sealant Step 3: Select a tool corner with the shape of seal you want to achieve Step 4: Run the tool slowly along the seal, always use the smooth side to trim the joints Step 5: Leaving the sealant to dry and cure Note: the product will come with 1 usage book. 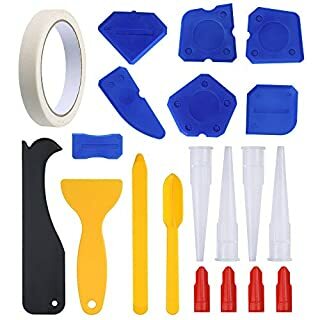 Wide application: Works well with most types of sealant, silicone, resin, grout and more; can be used to kitchen bathroom fitter sink, or other home sealing projects; DIY works or floor silicone sealing. 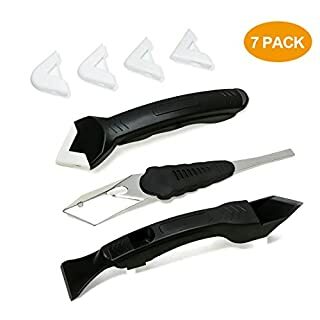 Warning:These sealant tools have sharp edges and corners. Please keep out of reach from children. 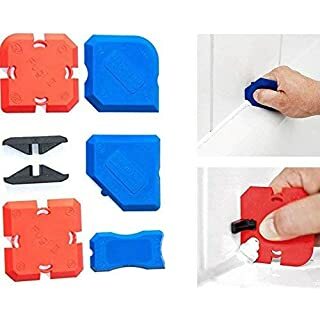 Sntieecr 20 pieces caulking tools kit for bathroom kitchen floor sealing Features: This multifunctional caulking tools kit is flexible, reusable, practical and cost-saving It can be applied to door, window, kitchen, bathroom, tank, sink joint filling finishing, DIY works or floor silicone sealant sealing, fit for most types of sealant, silicone, acrylic, resin, grout and more Usage of sealant finishing tool: 1. 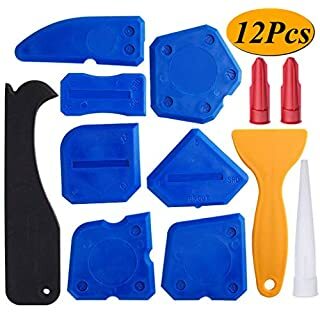 The caulking tool set can remove the old silicone sealant 2. Please left some lines for silicone sealant, and stick the sticky tape on the two sides of silicone sealant 3. Simply squeeze the silicone sealant vaguely along the line you want to seal 4. Select a tool corner with the shape of seal you want to achieve 5. Move the tool slowly along the seal, make sure they work well 6. Wait it all dry and rub off the thin layer left behind leaving you with good joints 7.Use soapy water or wet cloth to clean the tools after use Specifications: Color: As picture shows Material: Plastic Package included: 7 x Blue Silicone Sealant Finishing Tools 4 x White Caulk Nozzle 4 x Red Caulk Nozzle Caps 2 x Yellow Construction Angle Tool 1 x Masking tape 1 x Black Caulk Remover 1 x Yellow Grout Scraper Notice: Some small items included, please keep it away from children under 3 years old! 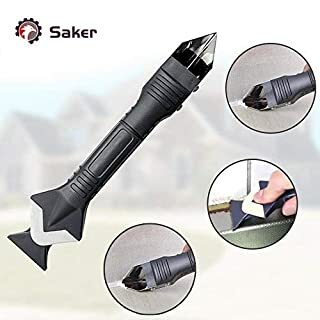 Saker 3 in 1 Silicone Caulking Tools, Your Ideal Tool In Home!- Use with the tool,saves half time toremove the dried caulk.- NO WASTE of sealant,excess sealant couldbe saved on silicone pad.- With 5 Sizes Radius Exchangeable Pads:3R,6R,10R,13R,17R for creating 5 shapes round angle.- Ideal for corners,showers,windows.Thesmart dimension is applicable for interior and exterior caulking. 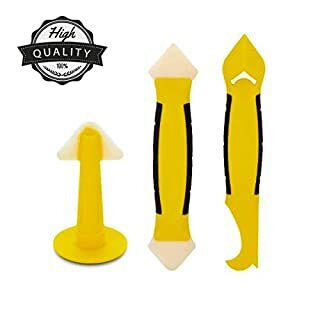 The item's color may be slightly different from the pictures. Please allow slight color difference. 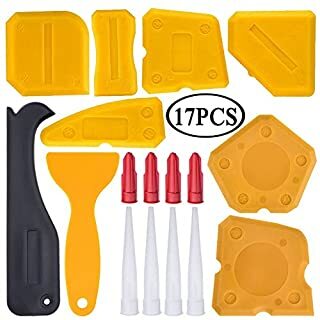 Specifications: -Color:yellow sealant finishing tool, yellow brush joint knife, white caulk nozzle -Material: plastic -Size: shown as picture -Weight: 150g Feature: flexible, reusable, practical and cost-saving Application: door, window, kitchen, bathroom, tank, sink joint filling finishing Package contents: -3 x Yellow silicone sealant finishing tools -1 x Yellow brush joint knife -6 x White caulk nozzle Notices: -These sealant tools have sharp edges and corners. Please keep out of reach from children. 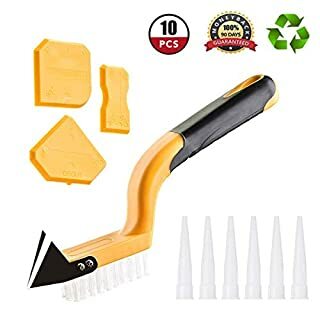 -Please clean immediately after use to extend its service life. IMPORTANT NOTICE EONBES brand is owned by CYHC-UK. CYHC-UK is the only seller of EONBES products. To avoid buying poor products and get the best shopping experience, please make sure choose the right seller before "add to cart". Always belive CYHC-UK. 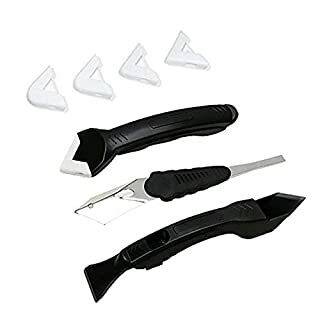 Product features: Material: Silica gel Uses: Silicone sealant caulking tool, trimming the silicone edge. Packing: Self sealing bag. 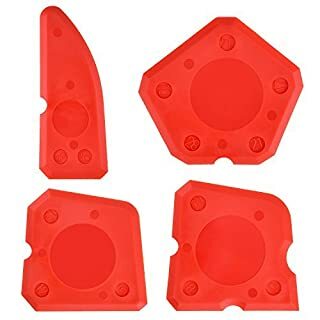 Package including: 1*black sealant removal tool 3*blue silicone sealant finishing tool 4*red silicone sealant finishing tool BEFORE USE Surfaces must be clean, dry and free from oil and dust. 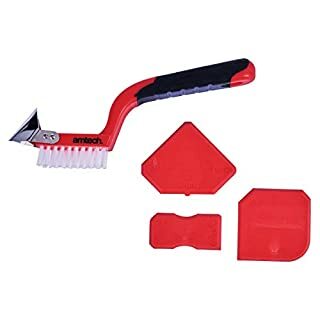 Remove old/existing damaged or mildewed sealants in the joints with a scraper, Apply new sealant, then use sealant profilers to trim the surface, Be sure to remove any excess sealant immediately. Always use the smooth side to trim the joints. 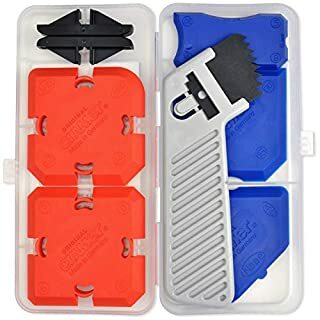 Amteker Caulk Tool Kit: Creates a good look seal every time, reduces wasted caulk or sealant; this set includes 1 rubber sheet and 8 tools with a variety of sealing edge sizes and shapes, easy to clean, reusable, can be used indoors or outdoor on caulking and sealing projects. 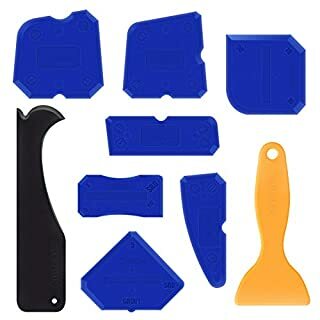 Specification: -Material: Durable plastic -Color: black/ blue/ yellow -Sealing edge size: SRD/ GROUT/ 2/ 4/ 5/ 6/ 8/ 10/ 14/ 20 - Quantity: 9 pieces - Wide application: Works well with most types of sealant, silicone, resin, grout and more; can be used to kitchen bathroom fitter sink, or other home sealing projects; DIY works or floor silicone sealing. 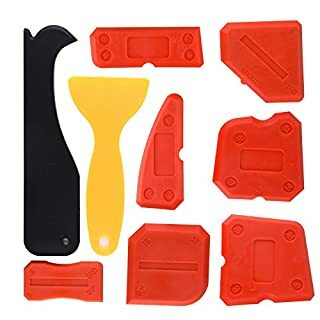 Usage: Step 1: Surfaces must be clean, dry and free from oil and dust; Step 2: Fill the sealant/ grout/ silicone, than remove any excess sealant; Step 3: Select a tool corner with the shape of seal you want to achieve; Step 4: Run the tool slowly along the seal, always use the smooth side to trim the joints; Step 5: Leaving the sealant to dry and cure; Warning: These sealant tools have sharp edges and corners. Please keep out of reach from children. 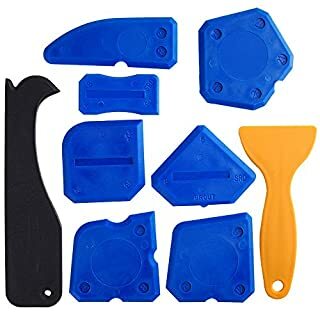 Flexible ergonomic design for smoothing silicone and grout. Can smooth six different profiles of various sizes. 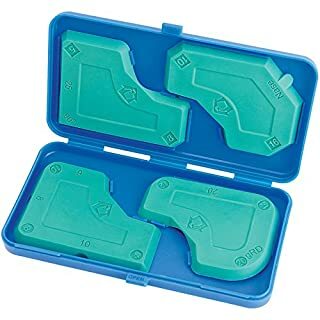 Supplied with storage case. Display packed.